I don’t buy my husband anything for Valentine’s Day. Not even a card. And he doesn’t buy me anything either. Not even a card. Do you still like me? I promise there’s a good reason for this! You see, in the beginning we were poor. As in, root around in the car seat cushions looking for loose change so we could do laundry poor. We decided then that Valentine’s Day was a sweet idea but that we didn’t need to do anything extra for each other on that day to show our love. Although, I might have made him do the dishes. Any excuse for that! But, then we had some munchkins come into our lives and it all changed. We still don’t buy anything (not even cards!) for each other but we do enjoy taking the opportunity to have fun celebrating this extra-sweet day with the sweetest two kiddos we know. 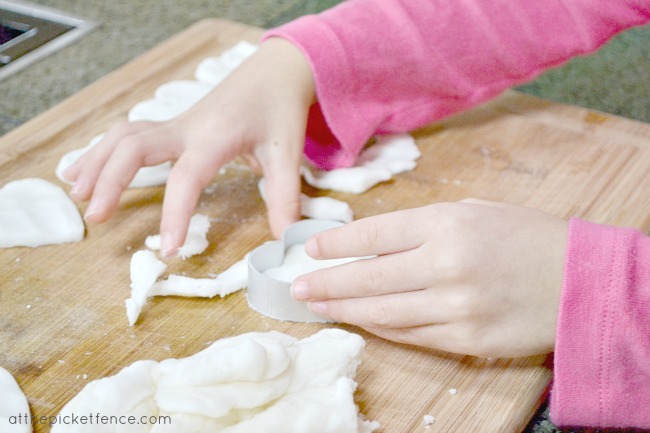 This year my youngest and I have had fun using homemade modeling clay in two different ways. 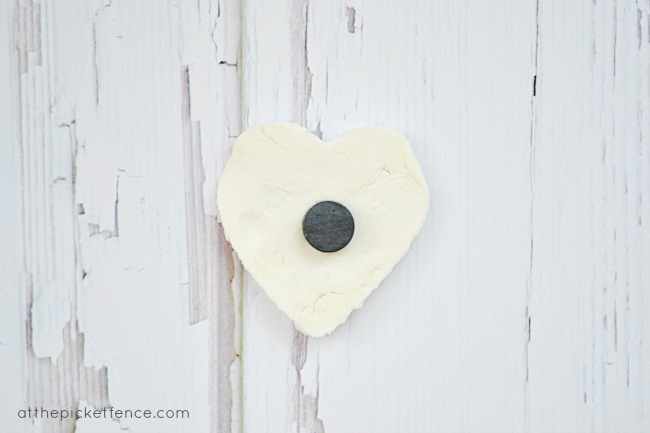 The first was to make these darling Clay Heart Tags. 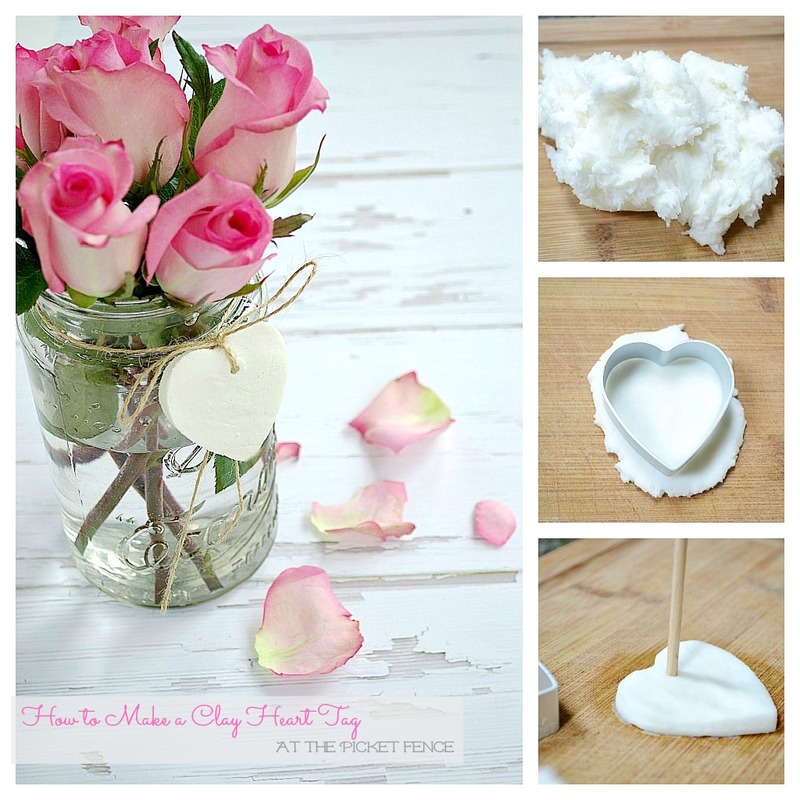 I’m including the recipe for this easy-peasy homemade clay at the bottom of this post. 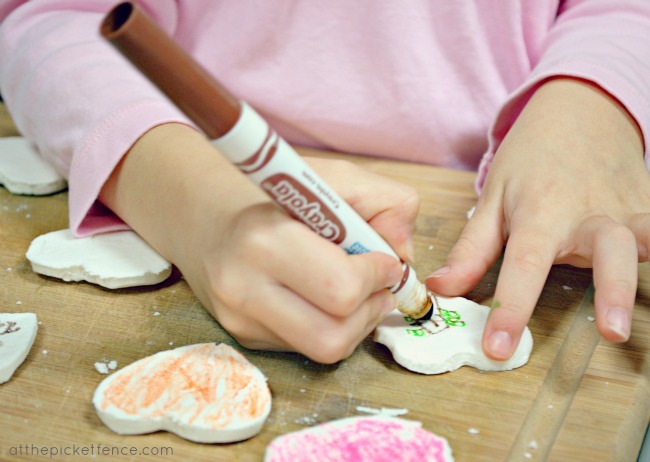 The second way we used our homemade modeling clay was to make Heart Shaped Magnets for my little Miss to give to her classmates at school. She cut out the appropriate number of hearts and we left them to dry overnight. Then I glued a small magnet to the back of each heart. I used superglue but you could also use hot glue. It just needs to be something stronger than regular craft/school glue. And they are all ready to be delivered to her friends on Valentine’s Day! Maybe we could call this one, “You’re the Apple of My Eye”??? Stir together baking soda and corn starch in a saucepan. Cook over medium heat stirring constantly until mixture resembles the consistency of mashed potatoes. Remove mixture and allow to cool on plate or cutting board. Once mixture is cool to the touch begin cutting out shapes and modeling to your heart's content! *Unused clay can be stored in refrigerator until next use. Warm up a bit in microwave to soften. As Valentine’s Day draws closer, I think back to those years of scrounging around in the seat cushions for loose change, dates where we had to share meals (we still do that sometimes!) and going window shopping because we couldn’t afford to actually go into the stores. Those were some of the sweetest times in our marriage and I wouldn’t trade them for anything in the world! Maybe this year I’ll get my husband a card after all…and tell him just how much those memories mean to me! 38 Comments on "Hearts Made of Clay for Valentine’s Day"
Vanessa, we don’t buy anything for Valentine’s either. It is just an over commercialized day to make money for the card, flower and candy companies. We don’t need one special day to let each other know we love each other. Anyway our anniversary is eight days later! We don’t exchange cards, etc at Valentine’s Day either. Did early on in our marriage but weened away. I don’t need Hallmark to tell my husband how much I love him. Such sweet little hearts! And what treasures, will be able to keep these forever…sweet! What a cute project! I’d love to make some of these with my class at school. Vanessa, thanks for the cute little project to do with my grands, sometime…pinned it to my DIY board for future reference and passing along! These are very cute, thanks for the recipe and sharing. So sweet Vanessa. I remember those days too! Thanks for the recipes- I have always wanted to try this. And your daughter’s are adorable. Thanks for sharing! Love these Vanessa! I was wanting to make a little something for my girls but didn’t know what. Going to make these this weekend, so thanks! Btw, my husband always brings us girls flowers and I buy See’s chocolate hearts every year (they are only available at Valentine’s day), but we don’t buy gifts for each other. My husband always cooks dinner for me, as well. Love these! So cute! Might have to make these with the kiddos – or just have you over to show me! Adorable hearts! What a creative mother and daughter! Of course, I’m a bit biased! And don’t feel bad – hubs and I ignore most holidays and give to one another (and for ourselves) year – round, and tend to lose the stress of the holidays by doing so. His birthday is March 7th so I tend to wait till then anyway to spoil him occassionally – most of the time we remain giftless and to be honest we prefer it that way. 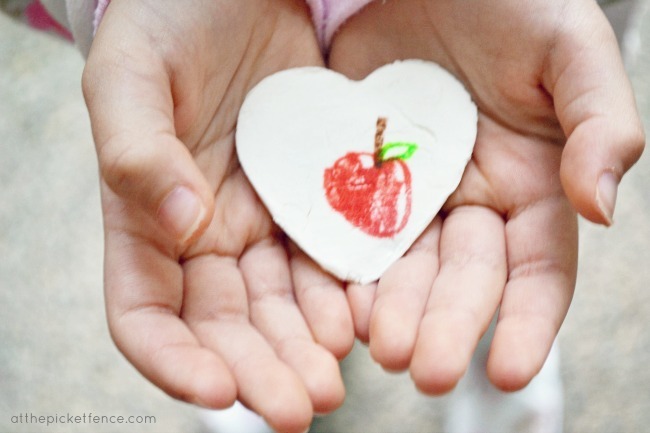 Love the heart magnet idea for valentines for school kids! that is just great. And your photos of the flowers are just gorgeous! Did I see on fb that you got a 50mm lens? I’m gettin one too – just need to get it ordered 🙂 And we don’t really do much for Valentines either. Sometimes I make my hubby a card, sometimes he thinks of getting one. But we usually feel like there are so many other things to spend the money on! I would love it if he’d do something fun for me some year though!! What a sweet story about your young married start in life. We,too, were “poor” when we first started out- makes me appreciate all that we are blessed to have now. Love that your daughter decorated her hearts using her own style- beauty is in the eye of the beholder. 🙂 I also like the look of this smoother dough. My salt dough recipe produces a rougher texture. 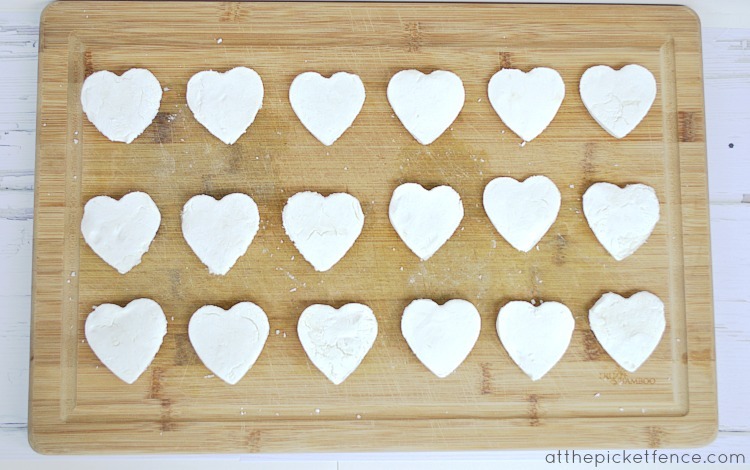 Just a quick question, does anyone think you could add a bit of food colouring to make coloured hearts? Would that work? 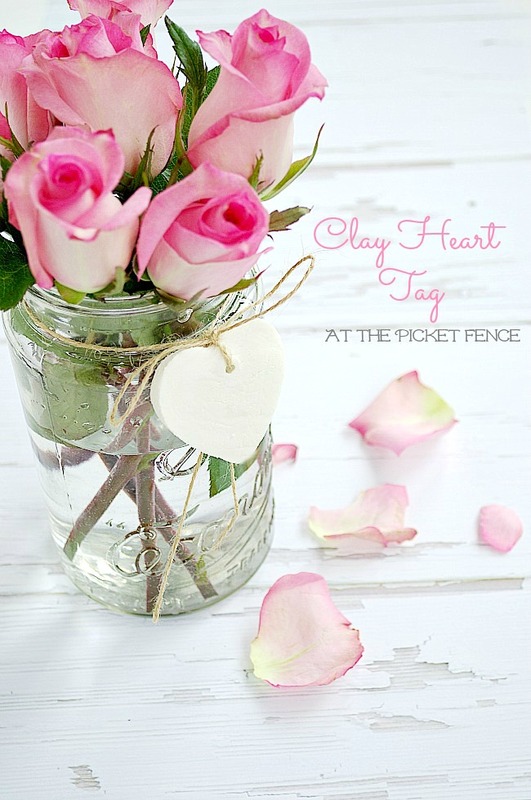 This project is so cute — and I love how it looks dressing up your mason jar vase! And speaking of mason jars … would it be okay to feature this on Mason Jar Crafts Love? You had me at “hearts”! I will have to try these…and the ones with the magnets for the little ones are so cute! How fun!